Westone Monitor Vaults are excellent hard cases designed to protect your full custom earphones, in-ear monitors (IEM's), and custom molded ear plugs. With a rugged polymer exterior and a foam padded interior, Monitor Vaults are ideal for keeping your custom earphones or ear plugs safe when you're on the go. Measuring 3.4" long x 2.7" wide x 1.9" deep, Monitor Vaults are the perfect size to carry in a pocket or purse. With high-impact construction to help cushion your in-ear devices from a fall and a weather resistant seal to keep their contents dry and safe, Monitor Vaults can help prolong the life of your favorite high-end earphones, IEM's, or custom molded ear plugs by protecting them from daily wear and tear. Note that these Monitor Vaults are weather resistant, not completely waterproof. So if you're planning on a nice afternoon scuba dive, don't expect your Monitor Vault to handle being fully submerged without the inside getting wet. Monitor Vaults aren't intended for underwater use. (Neither are your earphones, though... right?) But if you get caught out in the rain or splashed with a spilled drink, Monitor Vaults are definitely water resistant enough to keep the delicate electronics of your IEM's or full-custom earphones nice and dry. Can you use a Westone Monitor Vault with regular ear plugs or earbuds? Absolutely! When it comes to earphones and reusable ear plugs, it's important to keep them clean, dry, and secure between uses -- and this is true whether you have high-end IEM's or a pair of low-cost earbuds. If you and your favorite ear plugs or regular off-the-shelf earphones are never parted, a Monitor Vault will definitely do the job and keep them safe. Though Monitor Vaults were designed to protect precious, high-dollar cargo such as full custom earphones and IEM's, top-shelf audiophile earphones, and custom molded ear plugs, there is no reason you couldn't keep your beloved $20 earbuds in there, if you want to. Last but not least, Monitor Vaults look really cool. If you have awesome custom ear plugs or in-ear monitors, shouldn't they have an equally awesome place to live? 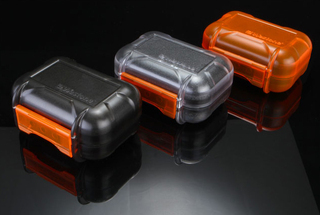 Monitor Vaults are available in three stylish colors: Clear, Smoke, and Orange. Westone Monitor Vault Hard Case for Earphones and Custom Molded Ear Plugs2ErikMarch 15, 2018Seller was great and easy to deal with. Wish this product had more padding inside to keep earplugs from bouncing around. It's basically just an Otter Case with almost no padding inside.